When your garage door business operates outside of the office, you need a dispatch software that will take you where you need to be. Smart Service is your all-round software that allows you to schedule, dispatch, and more—all while integrating with QuickBooks! The Smart Service mobile app for garage door businesses completes the functionality of your company. When your garage door technicians are on the go, the Smart Service mobile app acts as a connection back to the office. With it, your technicians will be equipped with everything they need to operate in the field. Office dispatchers can track technicians while they work in the field thanks to the mobile app. When a new job comes in, dispatchers can easily look at the calendar and find the best place to schedule the new task. 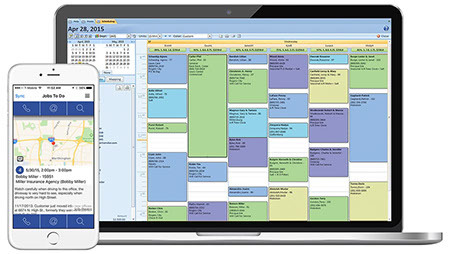 Smart Service uses location and time availability to find the optimal place to schedule new work. No more guesswork! Digital forms can replace the paper you used to use. Forms lost to food stains or simple mislocation are no longer an issue. You can fill out forms on your device just like your old forms, even collecting customer signatures! Collect payments on the go. With QuickBooks integration, jobs become ready-to-bill invoices without all the double data entry! Save time time and money with garage door dispatching software. Throw paper costs out the window because everything you need is on Smart Service. Optimized routes allow you to fit more jobs in a day and spend less on gas. This increased efficiency allows your business to save and make more money! Check out how much you could save using our ROI calculator. Curious? Request a free demo of Smart Service today to see what it can do for your garage door business! Run your garage door business the smart way with the help of these tips and tricks!